The crustacean-filled paella at Xiringuito Escribà. All photos by Angie Mar. Before she became one of New York City’s best chefs, Angie Mar was on a totally different career path. Inspired by a food-fueled trip around Spain, she returned home with new ambitions. Here are the restaurants that changed her life. SPAIN - Eight years ago, I was in the midst of a huge career change. I had left my job of nine years in commercial real estate, packed up two suitcases, and bought a one-way ticket to Spain with a yet-to-be-determined return date. I was traveling alone, spoke zero Spanish, and had never felt so alive. It was there that I discovered my true passion for cooking. I returned to the United States with renewed ambition, a new career path, and an even larger appreciation of food. 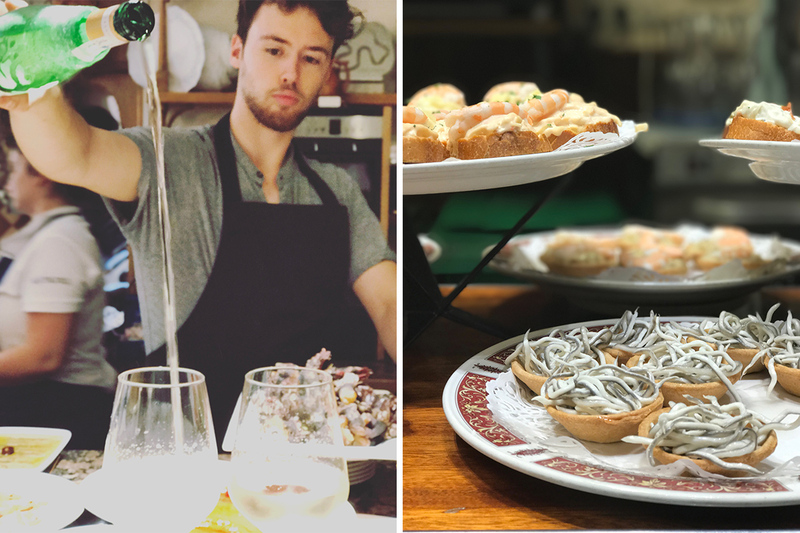 This summer, I went back to Spain to retrace my steps through San Sebastián and Barcelona, visiting the restaurants that had inspired me and ultimately changed the course of my life. I love the local institution because it's been around since the 1980s, with the old man who owns is always cooking in the back. There is only one table in the whole restaurant, and the line for steak starts at 11 a.m. During my visit, I waited in the rain, nervously chain-smoking like I was trying to get tickets to a Lady Gaga concert. I had the rib-eye, tomato salad (tomatoes with olive oil and salt), padrón peppers, and Spanish tortilla. He only makes sixteen portions of tortilla each day, so I was so honored to eat one of them. Go here for the best seafood. I splurged on langoustines, gooseneck barnacles, and all the crustaceans and bivalves. The best bet is to pick items off the menu and, while you are waiting for everything to be cooked, sit at the bar and drink txakoli (a super dry sparkling white wine) and snack on pintxos. If you feel like venturing out of old town and don’t mind a quick cab ride, head to Asador. I recommend going after 9:30 p.m. because that is when it gets lively. Be sure to order the chuleta (rib-eye steak) and foie gras terrine. The gambas (prawns) are cooked on a wood-fire grill, and they are delicious. The big, beautiful red prawns at La Boqueria. White wine and small bites at Ganbara. One of my favorite things is to do is visit the large market and wander the stalls, getting small bites at each stand. 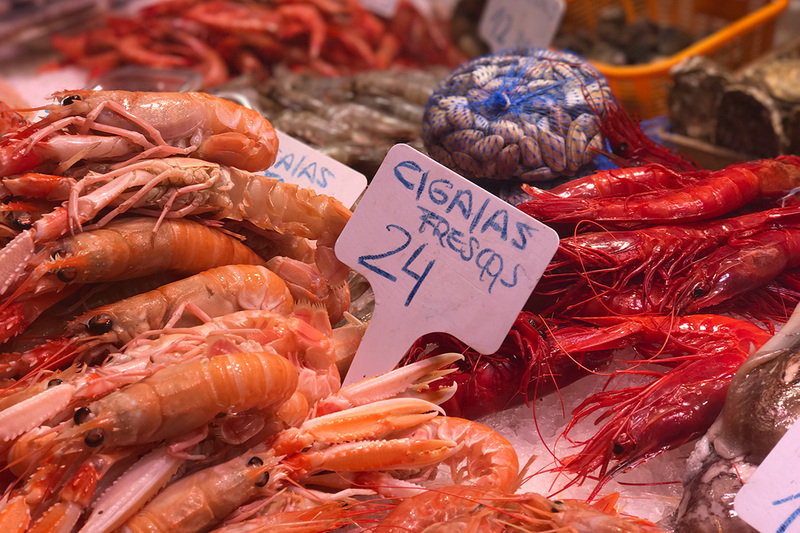 I recommend the bacalao — because anything fried on a stick is delicious, including cod — and the big, beautiful red prawns that you can only find in Spain. I always sip on the fresh raspberry and coconut juices. When I get tired of wandering, I find a seat at one of the counters and order pulpo a la planchca. I won't leave the market without eating jamón íberico. This is the place to go after you land. 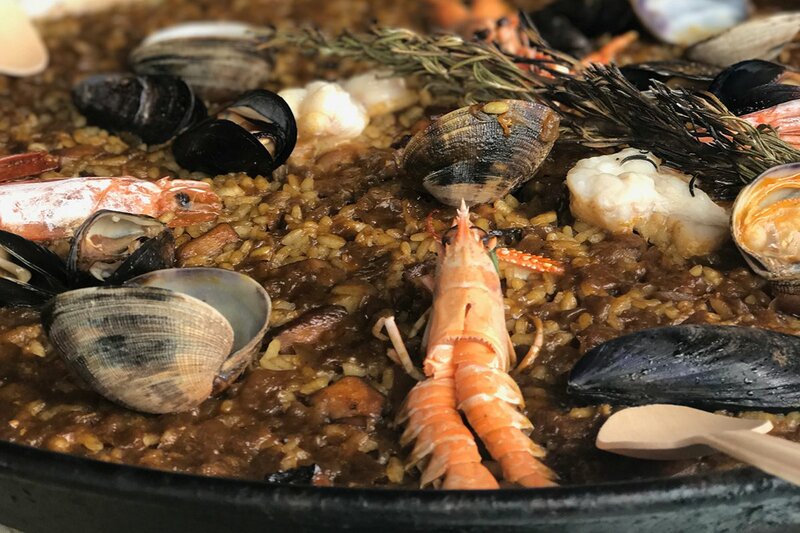 The open-air restaurant is right on the beach and serves a huge plate of paella filled with crustaceans, which should be washed down with a crisp, white sangria. Angie is a chef, meat lover, and restaurateur. You can follow her on . She travels for the culture, inspiration, and food.